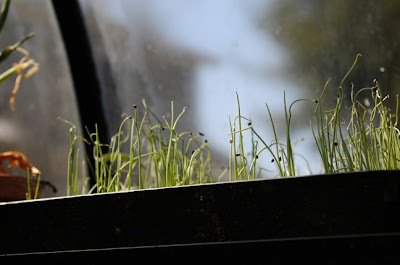 Any gardening blog worth its words this week will either be posting about four leafed clovers, or planting peas, for in many areas, particularly Zone 4-6, mid-March, on or near Saint Paticks Day, is the traditional time to plant peas, but why? Well, gardening is a practice with lots of heritage, after all, there was time not long ago, when all of our food actually came from our gardens. Our lives depended on what we could grow successfully, so that we could eat. In northern areas where there is snow on the ground until Mid March, especially in USDA Zone 5, it was common to hear old timers refer to certain events as guidance in planting or harvesting certain crops. 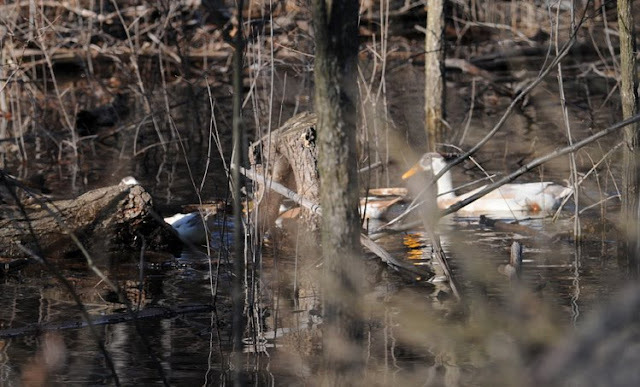 Full moons, spring peepers, maple blossoms, forsythia flowers, all have corresponding agricultural events in the great datebook of old-timer farmers, and as many of these things work, we continue the tradition. Peas can’t be grown by anyone, they prefer a cool, long, spring and ideally, one which is extended well into early June. 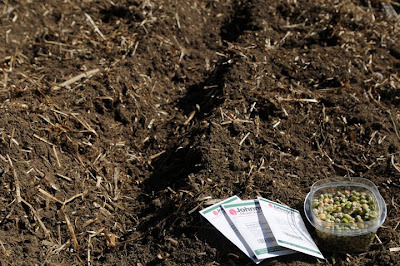 Since we can’t guarantee air temperatures in the highly variable transitional months of March, April and May, we all take our chances with Peas, and our odds are better if we plant early, or, as the seed packets often advise, “as soon as the ground can be worked”. If you are a new gardener, it’s easy to believe that all seeds from packets, can just be sprinkled in rows in the ground, and they will grow, but there is far more to know. Even today, I have to remind myself to read-up a bit more on everything that I sow, for if success has avoided you with a certain flower or veggie, simply learning what they require culturally, is step number one. 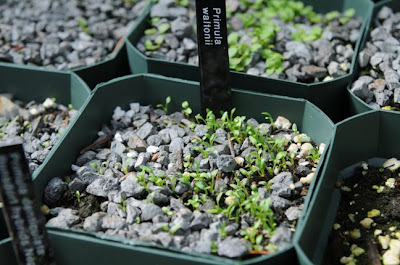 Basil need temperatures above 75 degrees to sprout, and if you’ve struggled in growing Bells of Ireland ( Moluccela laevis), they require near freezing outdoor temperatures and outdoor sowing, in order to sprout and grow. My Parents always planted their shell peas in March, as soon as the snow melted, and a pitchfork could turn the soil over without it being soggy. Muddy soil is not preferable, for seed will rot. I have learned that with my modern lifestyle ( work, long hours at the office, and little time to weed) that small, raised beds now make much more sense than the long, 60 foot rows that my parents would plant in the 1950’s and 1960’s. Now that I think about it, I have about 35 years of experience with growing peas of all sorts, so, though not an expert, I can say that I have experience with multiple healthy crops of Snap Peas, Snow Peas, Shell Peas, English Peas and cut flower Sweet Peas, so I will share the methods I have tried, and what has worked best. The late Jim Crockett was fond of saying, "If you are stingy with your peas, they'll be stingy with you." Indeed, I remember when he hosted what was then my favorite TV show next to Batman in the early 1970’s, Crocket’s Victory Garden, where he demonstrated how to plant your peas thickly in wide rows, so that they can climb up both sides of a fence. .
A. Pea Seeds ( any type, but consider the height, you may want dwarfer varieties to avoid elaborate staking). B. Some sort of staking material, which is critical, even for dwarfer varieties. You may simply cut brush and branches now and let them dry, such as birch, but they will need about 3 weeks to dry dead to avoid sprouts on the branches one stuck in the ground, or, you an buy netting, chicken wire or mesh. Bamboo poles, or traditional staking will not work, and tying string to sticks will only result in broken pea stems after a heavy rain. Just think like a pea – it’s all about the tendrils, and what tendrils will like-mainly, netting tightly stapled to strong 2x4’s. Since most peas will grow 6 feet tall, this is a major element to factor in. I use either branches from tree trimmings, mostly birch since you want ‘twiggyness’, and I shove the branches in just after sowing . Since I plant the seeds in trenches that are deep, and wide ( see below), the branches already mark where the peas are planted, and once they germinate, I the branches are already there, so I don’t ruin any roots or tender shoots. Plus, by adding the staking material in now, you are less likely to forget once the peas require it, which happens to be at the busiest time of the gardening year, around June 1st. B. Legume Inoculant – Sounds scary, but it’s safe and organic. Inoculant is a powder, a living bacteria, like (Yogurt for Peas – good bacteria to help them grow) . Inoculant is alive like yeast, so handle it carefully, keep it in a cool, dry place, and don’t over heat it. Use it all once opened, or toss the extra for it will die if kept over a season. It is used to dust dampened seed of agricultural legume crops like beans peas and soybeans, so that they can form root nodules that will allow them to attract more naturally occurring nitrogen-fixing bacteria (called rhyzobium). You can see these nitrogen fixing nodules if you pull your plants up out of the ground in mid-summer, they are little pink bumps. Inoculant comes crop-specific, so read the label carefully, for there is one specific for beans or for peas. There is also as a combo form, which is most common for home gardeners. There are lots of discussions on-line about whether there are any studies or not showing crops with or without, but I trust the agricultural experts on this one, and since it is not a chemical, I use it. Your soil may not require it, and others can grow good crops without, so I leave it up to you. You would need to buy it so that you have it when you plant your peas over the next few weeks, I always forget and need to order it separately. 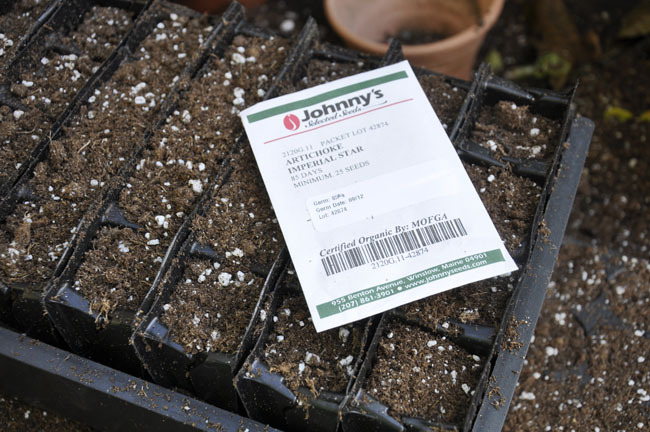 I get mine from Johnny’s Selected Seeds, but a combo Bean, Pea and Soybean Inoculant is available from Seeds of Change. Your local Agway or farm supply store may carry it also. 1. Buy Pea seeds, any kind, but buy a lot. The small packets will not do. Plan on a 1 Lb. bag per row 8 -10 feet long. Yes, a Lb per row. Read on. 2. Dump the dry pea seeds into a large salad bowl, and dampen them with water. Then carefully pour out the water, the goal here is to just dampen the seed so that the inoculant powder will stick. Pour in your inoculant, stir it around with your hand to dust all of the seed with the back powder, and you are ready to sow. 3. I dig a trench about 1 foot wide, and as long as a raised bed ( mine are 8 feet). The trench is about a foot deep, and I slightly flatten out the bottom. 4. Sow the seed by broadcasting it by handfuls into the bottom of the trench. Don’t be stingy, the seeds can touch, and the dense planting will help hold itself up. 5. Cover the seed with 1 inch of soil, peas will swell with the soil moisture and will sprout as the weather naturally warms. The 70 degree warm spring days and cool nights will help. Peas like to grow in cool weather ( 40 -55 degrees F.) but germinate best with some warmth, although, I have had little luck germinating seeds indoors or in the greenhouse, only because I get single plants, and a row of single pea plants will yield hardly enough peas to satisfy a snack in the garden. On must plant many peas, especially English peas, if you plan to shell them. I plant mostly Sugar Snap types and edible pod varieties, since the yield is better for a small space. 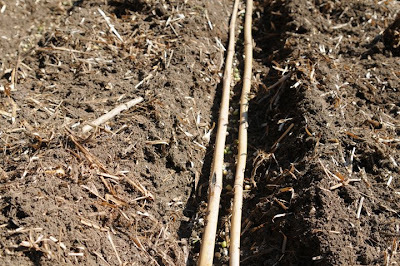 If you have a small garden, remember that a 10 foot row of shelled peas will only yield barely a cereal bowl full of shelled peas, whereas a 10 foot row of Sugar Snap may reward you with a bushel and a half if planted thickly. As any gardener will tell you, eating a fresh pea from the garden is amazing, and this is the primary reason why informed gardeners bother to grow peas. I think, tomatoes and peas are the two vegetables that taste nothing like a store bought vegetable, and rarely do fresh peas even make it into the house. Oh yeah, sweet corn, too. If this is the experience you are looking for, go get plantin’ them peas! 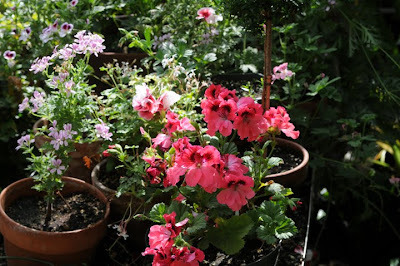 A shot of some Pelargoniums from the front sand bed in the greenhouse from last May. These we're still young, but now the plants are getting larger, and need some care so that a better display can be had. This means cutting back, taking cutting for young plants that will bloom next year, and ordering many more new cultivars and species. Something to do on a January weekend. A scented Pelargonium of the Apple persuasion, awaiting a hair cut. Cutting will be taken. 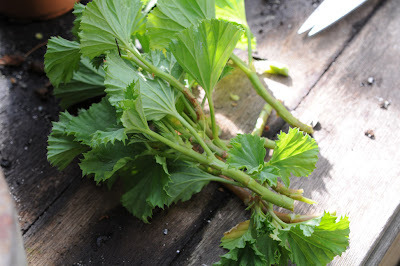 Trimmed back, this Regal Geranium will be fertilized and encouraged to grow on in the cold greenhouse, where it will set bud and bloom in late spring and early summer, as the days grow longer. 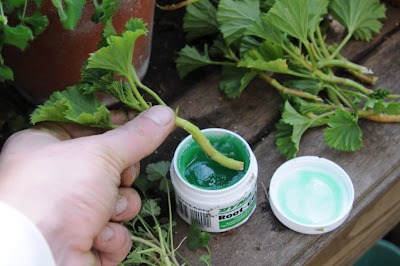 A dip into rooting gel, and then into the tray of cuttings. 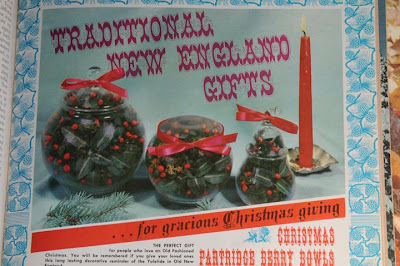 I had so many, that I was able to edit out only the strongest cuttings. With more cultivars on the way from Geraniaceae.com, I will need room! Regal Pelargoniums, or Pansy Faced types, awaiting to be placed into a propagation tray to root. A tray of Pelargonium cuttings, ready to be placed in a protected area in the back of the greenhouse, on the sand bed to root. Regal Pelargoniums, or more commonly known as Regal Geraniums or Martha Washington Geraniums have a long history as a flowering pot plant in both North America and Europe, but they also have a strong following with greenhouse enthusiasts who look forward to their blast of flouncy flowers in May and June. Other crosses which are similar in floral shape, are the Pansy Faced varieties, which also have a large, fancy flower. Regal Geraniums are not true Geraniums, but most of you all know that, they are Pelargoniums, but hybrids with a showy, large flower head, and they require a unique treatment compared to other Pelargoniums, for we grow many types and species, ranging from the summer dormant geophytic species all the way up to the common red geranium. But Regals require regal treatment, for they take longer to come into flower than the zonal type of pelargonium (the ones that people usually call geraniums). Commercial growers have to worry about all sorts of things ranging from the perfect fertilizer at the perfect time, and artificial lights ranging from 14 hours to 18 hours of daylight, so most just buy pre-bud-initiated liners ( rooted cuttings with buds) and then pot them on. As a home grower we can relax a bit, but this is because we have a cool greenhouse. 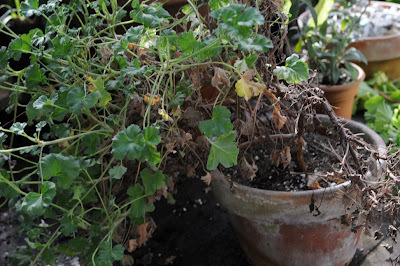 Indoors, keeping Martha Washington Geraniums is more challenging, since they require a long, cold winter period blow 65 deg. in the day, and around 50 at night. So combined with their complex photoperiod, and their need for cool temps, you can see why they are difficult as house plants, but dumb easy in a greenhouse. If you have an old house, with an unheated sunny room, or a sunporch, or a cold window, they might be easier, but if you live in an apartment or a modern home, getting them to bloom will be as easy as getting any other old fashioned house plant into bloom like a Clivia, virtually impossible. The large, flowering Regals one sees in May for Mothers Day are grown on a biannual basis, where it takes two years to get a decent sized plant. But I have both larger stock plants, and smaller 3 inch pots. 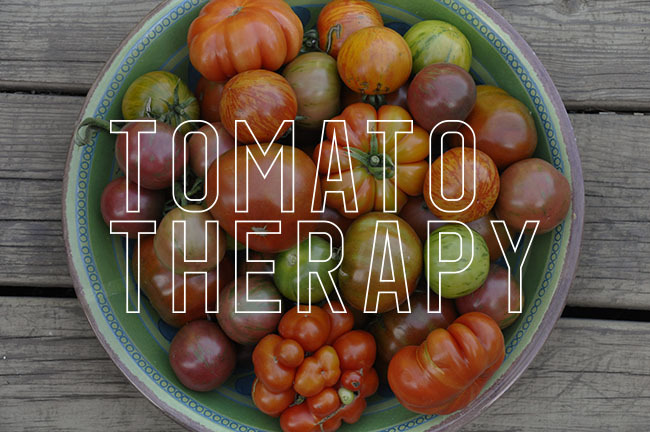 Both require cutting back while they are in their slowest period of growth, which is now, during October to March. 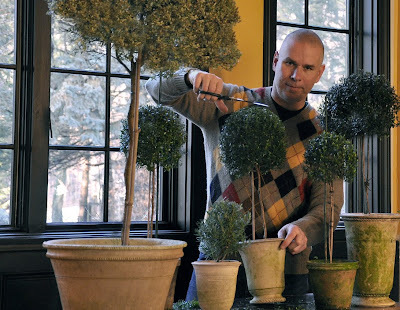 I am taking about a dozen cuttings of each cultivar, and plan to plant about 3 to 5 cuttings per pot. A simple dip in rooting hormone ( I know, I should have removed some rather than dip the cutting in the container, but it's my greenhouse and I am lazy!). 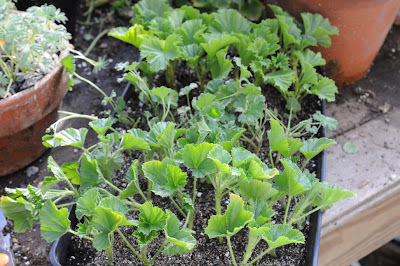 These cuttings should root within a few weeks, for these Pelargoniums root fast in the cool nights and warm days in the greenhouse. The mom plants were repotted with fresh soil, and fertilized with a weak solution to get them started. The are all now moved to the upper shelf into full sun, and soon growth will begin. If you are looking for some interesting Geraniums or Pelargoniums, then try some of these sources in the US. Geraniaceae.com, and in the UK< try Gosbrook Pelargonium Nursery ( why don't I live in the UK? WIll someone find me a job there?). Last Saturdays fine weather kept me in the greenhouse for most of the day, and it wasn't difficult to find chores to be done, most of the pleasant. On the rear wall sill above the foundation, sat a tall lanky Eryops pectinatus, a rather common South African daisy, often grown as a summer pot plant for its golden yellow daisy's and silver foliage. Euryops = from the Greek "eurys" = large and "ops" = eye referring to the showy flowers. pectinatus = from the Latin meaning pectinate (i.e. with narrow divisions like a comb referring to the divided leaves).Euryops grow woody with age, looking in Californian gardens, more like an aged sage shrub rather than a daisy. As I said in my previous post, I am generally, lazy, and find myself wasting money on new plants each year for no reason, which is silly, since I have a greenhouse. Euryops cost me about $8.00 per plant, which is nothing more than a rooted cutting in a two inch pot. 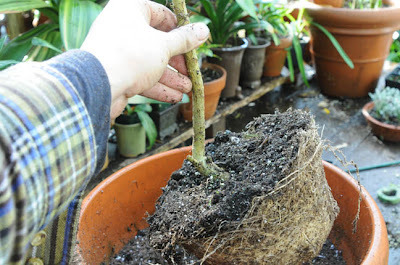 For a plant which roots easily, I decided to bring last years plant into the cold greenhouse, and then take a few cuttings, which I did last weekend. 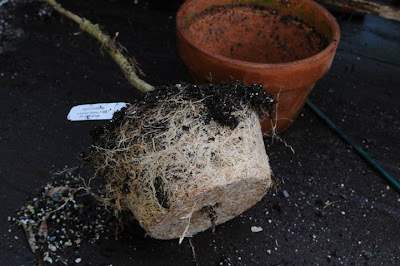 A little damaged from frost, the plant still gave up about 9 cuttings, which I dipped in rooting hormone, and placed in soil on a heated bench to root. I will most likely repot these cuttings in a month, and pinch them back after taking another set of cuttings later this winter. By spring, I may have a flat of 30 or so cuttings, which will allow me to plant a hedge or something more impressive than a single pot. 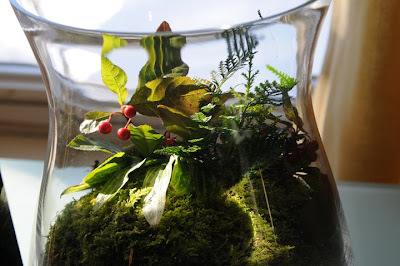 I was left with the mother plant, which I was going to toss into the compost pile, until I noticed that if I trimmed the plant, I could have a standard topiary with little effort. Eryops make terrific standards - plants trained to a single staked stem, then allowed to branch out at the top. Euryops can be trimmed, but carefully, one has to be careful to leave enough growth for flower buds to form, since they form only on the newest growth, terminally. Even though I have trimmed this specimen harshly, by May, it should branch out beautifully, and by summer, I expect it to be perfectly gorgeous. SO first, I need to find a large clay pot. I was surprised at how tight the rootball had become. 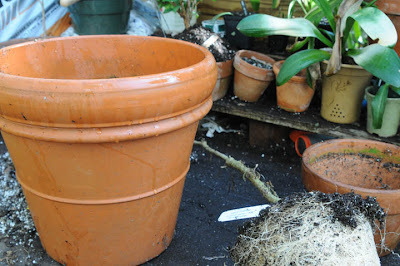 Clearly, this plant needs a much larger pot, so I decided to save the plant, and pot it in a significant pot, for if one is going to commit to growing a South African Daisy, I might as well go all the way, and let is have it's full root run, which is deserves. 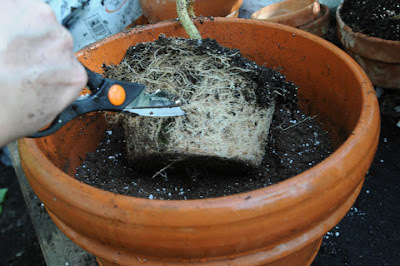 The first task was snipping the root mass, to stimulate new root growth. This may seem severe, but it is less invasive than tearing the root ball open, which could damage the root connections to the stem, and could crush the tender roots disabling them. 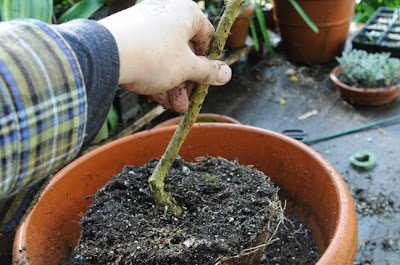 When I placed the root ball into the fresh soil and pot, I realized that the angle needed to be changed, since I had trimmed the multiple stems down to a single stem, which was growing off at an angle. 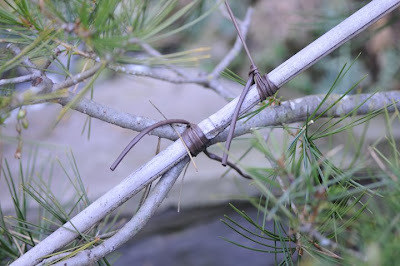 It was easier to simply tilt the root ball rather than to tie and restake the stem. 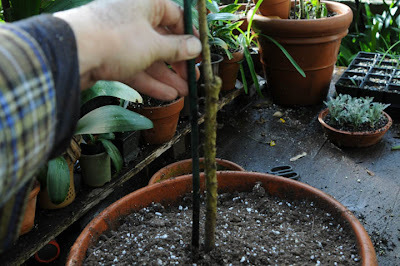 Once the rootball was properly positioned in the pot, I filled the gaps with soil, and placed a new bamboo stake close to the stem. The only thing left, was to tie the stem to the stake with strands of damp raffia, which protects the stem from possible damage which often occurs with wire, or rope. It's difficult to see in this photo, since the topiary behind this is blending in, but if you look carefully, you can see the Euryops in the foreground. It has no leaves, but in a few months, this should look completely different, and it will look awesome on our bluestone terrace as a specimen plant, blooming all summer. The next three posts will show what we did last weekend. IT started with a Trough building workshop hosted by the Berkshire Chapter of the NARGS ( North American Rock Garden Society and Wrightman Alpines) and was held at the home of Berkshire NARGS chapter member Robin Magowan in Litchfield, CT. We then moved on to tour the gardens of another NARGS member, Elisabeth Zander in nearby Goshen, CT. So these three events and gardens deserve three distinct postings, the workshop by Harvey and Irene Wrightman, Robin's garden, and Elisabeth's amazing garden. First, the workshop. Last Saturday was about a perfect, an autumn day can be in New England, and Litchfield County, Connecticut wasn’t too shabby, either. Joe and I we're fortunate enough to be invited to participate in a trough building workshop arranged by various members of the National Rock Garden Society's Berkshire chapter, and alpine plant nurseryman, Harvey Wrightman, of Wrightman Alpines in Ontario (they ship to the US, thankfully!). 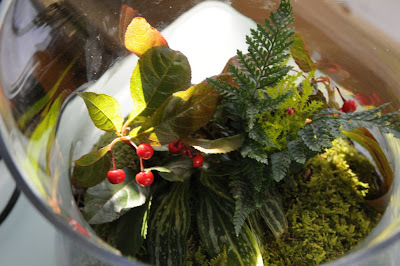 The workshop featured a demonstration on a new way to grow alpines in troughs, which was introduced to Harvey by plantsman and explorer Josef Halda, who is friends with Harvey, and who toured the US and Canada earlier this year while on the NARGS national speakers tour. Halda also stayed with us while in New England in May, but we only discussed this new method, which seemed rather unbelievable, but the results we are seeing are quite impressive. 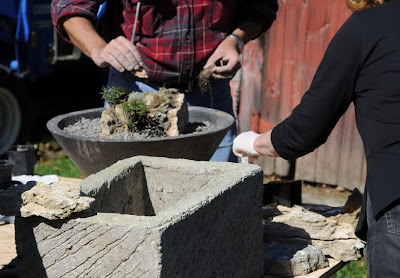 Saturday's workshop/Demo showed how clay can be used as a growing material for some high elevation alpines when sandwiched between sheets of split tufa (limestone) rock, which is porous. 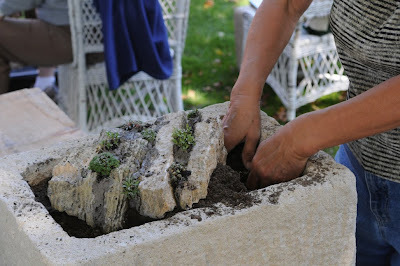 About 15 of us watched Harvey's wife Irene demonstrate how to wash the soil off of young, potted alpines, or from rooted cuttings, and then focus on how she smeared with a trowel, a slab of rock with the muddy mixture, not unlike making a sandwich. The plants roots are pressed gently into the clay, and the top, growing crown is left emerging. Finally, another rock is pressed on top, sometimes with a bit more clay (mayo) and voila, you are done. We all enjoyed making these alpine sandwiches, and then placing the assemblages into sand and gravel, which filled our troughs that we brought. Then, smaller plants, some rooted into pure tufa rock, are places around the structures we made, and finally top dressed with gravel. Trough are a traditional English method of cultivating certain more challenging high alpine plants which prefer particular conditions such as scree, crevice or tight rock cracks, where they often grow and mature into tight, hard, bun-like structures, or, simply remain small. Although these plants demand exacting conditions, often a complex combination of fast drainage, constant moisture and frigid winters with no thaw, fast snow melt, permafrost, etc, alpine plants are becoming more popular with people who are concerned about the environment, for they are more endangered than ever, with threats of global warming, and ski areas being relocated higher in the alps and world wide, the declining phenomenon of permafrost in Alaska, and other environmental threats from the encroachment of humans into fragile habitat, if you are looking for a true 'green' statement that really means something, an alpine trough garden may be something to consider. These are not easy plants to get, or to grow, but once established, are rather care free, which is surprising, even to me. A perfectly planted trough can remain untouched for years if sited well. 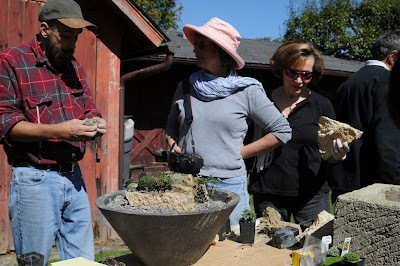 This workshop introduced many of us to a new method of growing these fussy plants. The method is just about the exact opposite of how the world of rock gardeners have traditionally cultivated these plants, so sit tight, and listed. 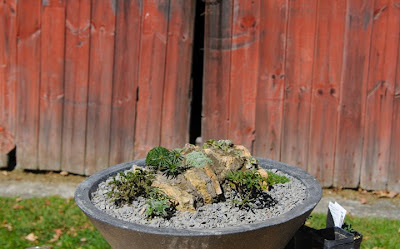 These hard, limestone encrusted Saxifrages and alpine gentians and primula which typically would be grown in a gravelly, mix of perlite, rock chips and soil, are instead, planted in wet clay. That's right, wet, sloppy, clay. 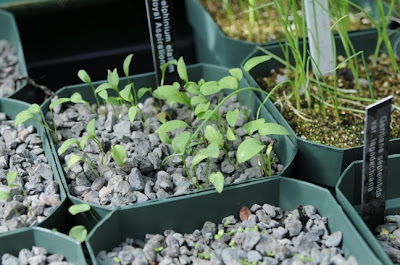 This is the odd part of this method, - the clay, since it seems counter-productive to what one normally uses to pot alpines in, mainly, and alpine mix which is fast draining, with a little organic material. But when one thinks about the science of it a bit more, you can see the logic. Many alpines grow best, to character, dense and tight buns, when grown in pure tufa or limestone rock. Their tiny hair-like roots can move between the channels in the rock, and the plant grows hard and dense. Clay, when surrounding the roots, is mostly limestone elements and particles, with enough grog and chip to still move water through, but only when not fired (think clay pot, when wet), It is both porous and solid. I assume the clay soil once dry, never becomes mud again, but simply sponges water in a capillary action. And since the volume of clay is small, the mass never really exposes its surface to large amounts of water, since the clay is basically filling a crevice, and not a pot. Gravity and capillary action drays water up and down, and in this 1/4 -1/2 inch sheet of dry clay sandwiched between to porous slabs of rock, the perfect temperature and moisture levels are maintained. Of course, we still need to see results, so stay tuned. 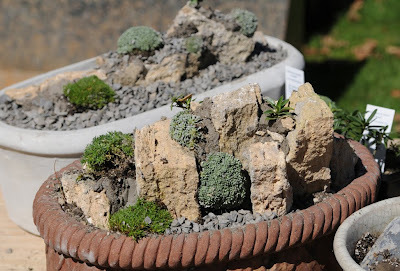 But the pieces I have of pure tufa, in which silver saxifrages and Primula allioni are growing in, are 2 years old, and in perfect, hard, character, as if growing on top of the Alps. And, they are in full sun, in troughs, which I rarely water, if at all in the summer, and are exposed to all the winter snows and cold a New England winter can toss at them. 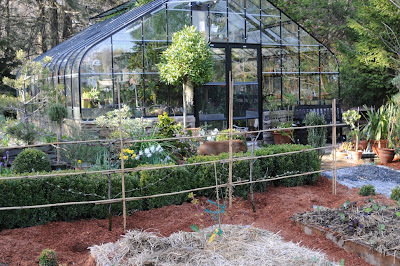 This weekend I planted four espaliered apples along the back of the kitchen garden, infront of the greenhouse main bluestone walk lined with boxwood. This part of the garden, which was all weed trees and weeds chest high four years ago, is still in the re-building phase, even though you might think that the photos make it look rather fancy, if I stepped sideways or turned around, you would see the mess......maybe I should do that for a posting...show the reality of the place! It's a little embarasing. I will have my own fruit harvest!!! This time, appled. Winter Banana and Cox' Orange Pippins anyone? It doesn't matter where one lives, you could have espaliered trees......All you need is a wall, or a fence, or construct a structure like this one in Australia. 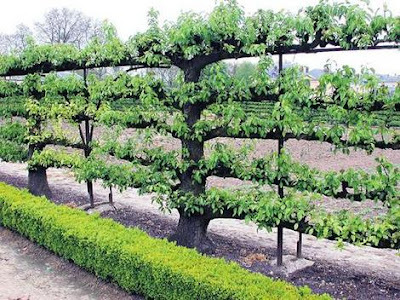 Even in Japan, or Germany I have seen amazing espaliered forms of fruit trees and other woody plants, trained into classic 'espaliared' froms or even in simple rows, for the main reason is space reduction, even though they look beautiful to the eye year round. 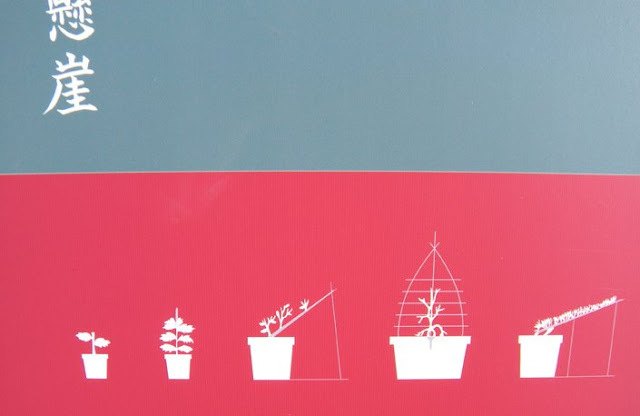 This is an economical way to both add structure to you garden and to add to your harvest. Add in blossoms in the spring, and a nifty hedge, and it's clear that this is a 24/7 hit. Nothing says spring, better than getting into the soil and working it. In New England, the old 'yankee's' followed the rule that peas should be planted on St. Patricks day. Well, at least I planted them in the same week. Most years, it is always a surprise how fast things can change in a week or two. Two weeks ago, we had 14 inches of snow, and 5 days ago, it was 12 deg. 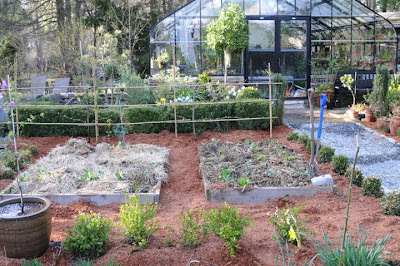 F. Now, these raised beds are thawed, drained and the soil is friable. ( not so much, the ground not in raised beds, however!). We still have snow, where there is shade, and the frost is still deep in many places. But where there is sunshine, the ephemeral wild flowers are beginning to emerge, as are perennials like Hellebores and Primula, which only a few days ago, we're invisible. 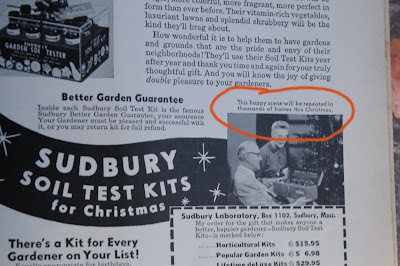 It seems like everyone is growing a 'victory garden' this year'. 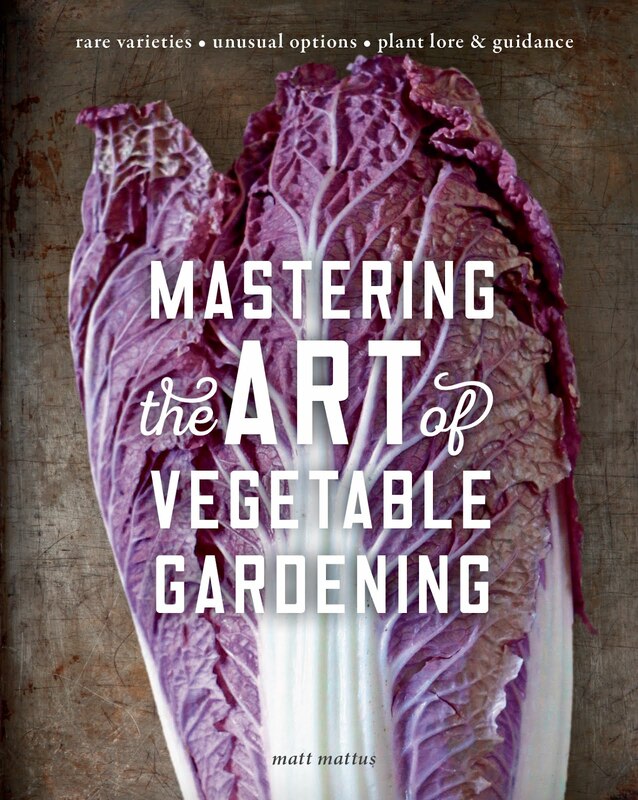 A search on Amazon.com shows that vegetable gardening books are leading the pack in best sellers. 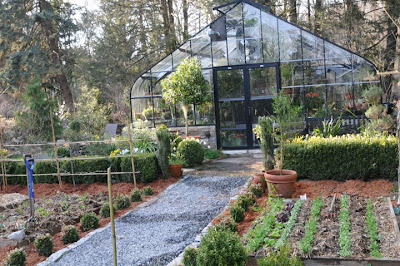 At our place, the greenhouse construction ruined much of our large family vegetable garden, which my grandfather started in the early 1900's. But the soil, which was trampled and lost composition from the tractors and rock, begins to repair itself over the past ten years, I decided last year to start a small attempt at vegetable gardening with the addition of a few raised beds, which would be more manageable than the massive attempts at vegetable gardening that I had made ten years ago. Keeping a large garden and a full time job proved to be too much, but I really missed the fresh veggies, and the cost at the farm stand for tomatoes alone, even in August, has forced me to reconsider,, but at a different scale. This past weekend I was able to turn over two beds, which I had covered with hay and manure from the duck house in the fall. The soil looks so much better with the addition of the new organic material, and what hay has not broken down over the winter under the snow, will do so quickly at the soil temperatures rise. I was able to plant snap peas, three rows only 9 feet long, hardly the 60 foot long rows I used to plant!, as well as a few short rows of fast crops in between the rows of peas, to maximize square footage. Often referred to as French Intensive gardening, or Square Foot Gardening, the relatively small space occupied by my new raised beds will still offer enough space to grow enough fresh vegetables for our kitchen, but perhaps not enough to 'put-up' or preserve, as I would like. Still, it's a more realistic attempt. Last year I grew tomatoes, a few Zuchini and some cucumbers and Basil. Not even close to the garden I had in 1996 with 0ver 30 varieties of Tomatoes and nearly 100 varieties of veggies ( four types of Fennel, and even one for fennel pollen!). I was a little obsessed then! BUt since I love to cook, I have moved toward growing more this year from last, with plans for growing either those veggies that I cannot buy at out local stores ( unusual chili peppers, heirloom tomatoes, unusual herbs) or those veggies that are so awesome when picked fresh, that even farm-stand varieties can't come close ( tomatoes, peas, lettuce, early cabbage). There are so many vegetables that are rarely grown by small farms, since they are too tender, don't ship well, wilt quickly or are too unfamiliar to the consumer, that they must be grown by home gardeners. Like early cabbage varieties, some of the pointed head varieties like Arrowhead, a favorite fast growing, sweet and crispy early cone headed variety of cabbage that will convert any cabbage hater. Some unusual perennial seeds like these Primula waltonii seedlings are beginning to emerge, after being stratified all winter ( left outside, under the snow, to stimulate the seeds to grow). The seedling of perennials and annuals are coming up fast. Delphiniums, expecially the choicer varieties are only available if grown from seed. These are some Blackmore and Langdon white and grey forms, which won't bloom for another year or so, but will be nearly 8 feet tall. You would never find these at a garden center. 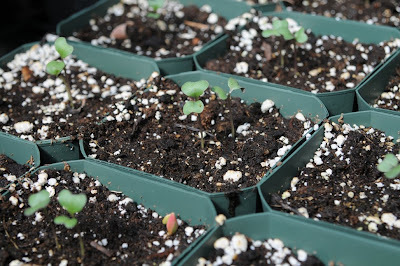 Cabbage seedlings will grow fast in the warm greenhouse, and this early variety even faster. 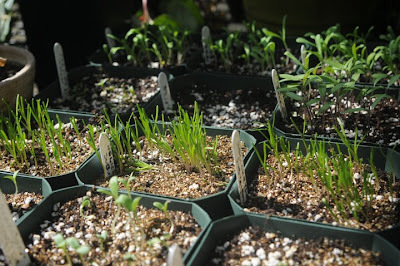 So the trays are brought outside on days that are above freezing, to strengthen them, and the strong seedlings will be planted out in about three weeks. 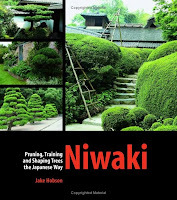 Last spring I bought the this wonderful book by Jake Hobson called Niwaki - Pruning, Training and Shaping Trees the Japanese Way published by Timber Press. I was hoping that it might show who to prune my Pinus species and cultivars into the shapes one sees everywhere in Japan. The book delivers much more, and not only is an informative and well designed book with lots of color photos and idea, it also covers more than just pines, with chapters on deciduous shrubs and trees, azaleas and more. If you have never heard of the art of Niwaki, the book is very informative and it explains the entire technique, history and artcraft of this amazing cultural art. Some fan photos of the art of Niwaki from the Amazon page for the book where readers can post their own photos. After reading the book, I was so inspired to try some large-tree training myself. On my first trip to Japan, I took dozens of photos of the plant life, not even realizing that the mounded shrubs, azaleas, and large, horizontal sweeps of branches on the pine with their flat, upward facing needles were not unique species of some Japanese forms, but actually trained specimens, shaped over years to look like mature trees or rocks, or other natural shapes like clouds. The Japanese are so connected to nature and they appreciate this connection in a way no other culture can come close to, that the effect one experiences in the best Japanese garden, often fools even the experienced mind. After reviewing much of my photos now, I realized that most of what impressed me in the tiny alley gardens and the sweeping vistas in the public parks of Tokyo and Kyoto, were actually carefully trained forms, where everything was consdiered and evaluated - each needle was either trimmed or trained, every bud addressed and either removed or allowed to grow, and each branch carefully trained with bamboo poles and rope to achieve a perfect form. Someone once told me "oh, those Japanese are so into control with everything!" but I see this as the opposite, the Japanese look at this craft as more of an art, not unlike Bonsai, the goal here is to shape a tree to look like a either an old one, or a specific shape. Get a sheet of paper, pick up a pencil, and draw a tree. That is a niwaki. It's not living, of course, it's not a real tree. Instead, it is your interpretation - however hastily drawn, however unplanned". Now take is further still, and actually grow a tree. Here you run into trouble; the tree appears to have a mind of its own. it does not look at anything like the sketch you drew, or the model you built. Oh well, it's a living and breating tree. This is where gardeners in the west stop. "It's a tree; let it get on with it". 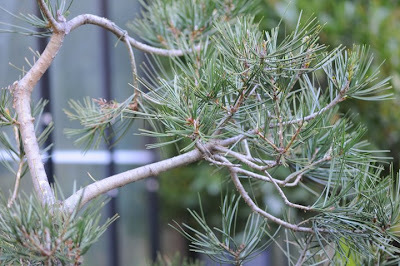 Left to grow on its own, it may be as long as a century to look as magnificent as one of the noble, ancient spruces do high in the mountains, or a gnarled, twisting pine on a cliff in Oregon.For the Japanese, the process of growing a garden tree is not wholly unlike sketching or building one. 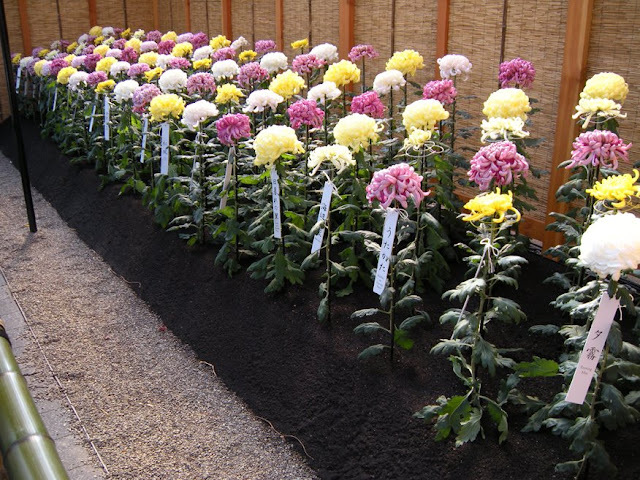 Observations, memories, emotions, and thousands of years of cultural and practical tradition inform Japanese gardeners and nursery workers as they coax out those features believed to signify a particular essence. Sounds like art to me. Some of my tied pine branches in June. I don't have the patience or skill but this still worked. This all reminds me Japan since anyone who visits, will notice gardeners. Men dressed in blue jump suits, with pruning sheers, hand clippers, tiny brooms, clipping and snipping and carefully and thoughtfully addressing what appears to be each blade of grass and they tidy around the public gardens or hotels. They are everywhere. A westerner can't help but notice that they all look like they love their job, as if they are professors or Doctors, they are need, tidy, professional, polite. A far cry from the American definition of a landscaper - generally a pick-up driving, lawn mowing, Abercrombied teen. 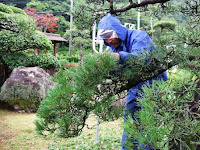 In Japan, gardeners are professionals, they are trained, focused, informed and they must be experts in their craft. I have to add, that much of Japana is like this, so part of this may be cultural, for even the young woman in the 7/11 near my hotel was polite, cheerful and attentive as she took my 25 yen for a pack of gum, or the taxi drivers who where white cotton gloves, and have impeccably clean cars that are obsessively tidy with starched white lace seat covers, and spotlessly sparkling windows. Being proub of whatever one does at any tast, must be veyr Japanese. But back to training my pines! Pinus Bungeana - Lace Bark Pine before final fall trimming or Momiage. I have this Pinus bungeana growing near the greenhouse, which I planted just after building the greenhouse as a seedling. Now, ten years later, it is growing larger. 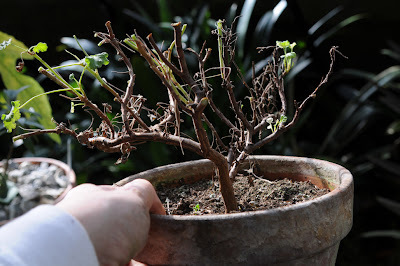 I thought I might try training it a bit, so that it would remain open and look more aged, while at the same time, not shade too much of the greenhouse. Not a true niwaki, since it has a single trunk which is to thick now for me to train or push to an angle, I am still going to train it to have the horizontal sweeping branches, and a flatter top crown. 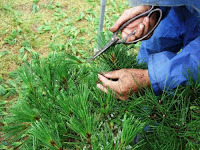 THe process of shaping a pine is achieve with specific tasks throughout the year. They are all fun, and actually realaxing, at least for me. After a November Momiage ( removal of past years needles). Now the tree is starting to look older, with more wood being exposed. I have to admit that even with this fast five month training session, this pine is starting to look amazing. You must get this book to understand the steps,. 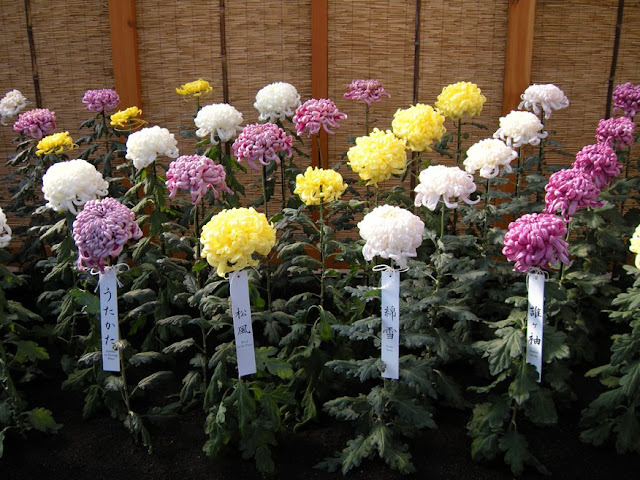 but briefly, one must tie and train in the spring, remove the first flush of spring growth -the candles, which snap off easily, in aprocess known as Midoritsumi ( literally 'green picking'), and then the second flush of candles which come in July, are smaller - these are snipped in half. 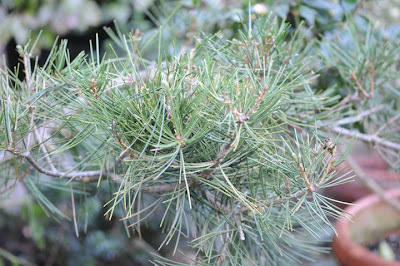 Then, in November, the past years needles are pulled off in a process known as Momiage, or fall thinning. The Japanese have names for many things we never think of, even the sticky pine resin is called Matsuyani, and yes, this is a very sticky hobby. The Japanese native woodland bamboo, which is hardy in New England, the species Sasa Vietchii, is starting to get it's trademark white leaf edges which starts to appear after the first hard frost. 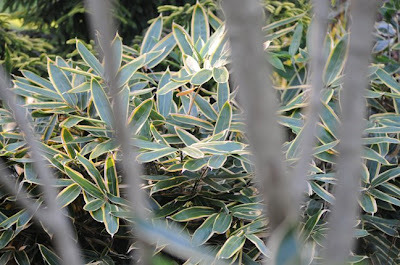 This bamboo does creep, although I would not personally call it invasive since it is rather contrallable., I choose to live with it because it is one of the few plants that looks good year round, It's evergreen foliage looks best in winter, and weeds cannot grow through its dense mat in summer. 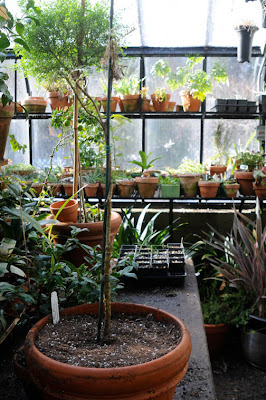 It is not impossibe to keep it somewhat within a certain space, and if you are a lazy gardener like me, it is perfect. 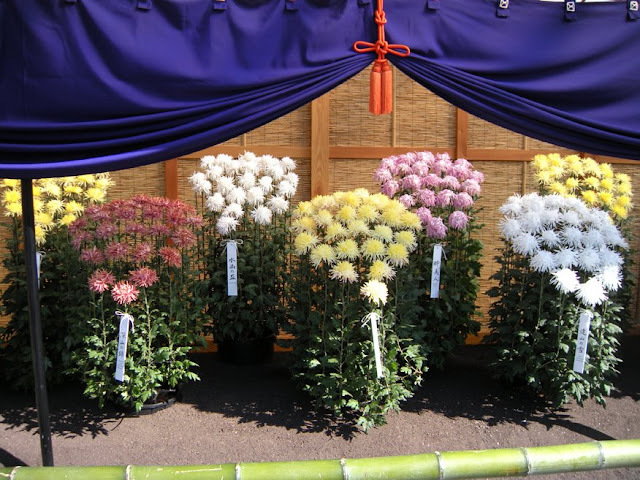 Chrysanthemums, trained to Ogiku style or 'single-stem' forms, are a traditional method of training certain chrysanthemums which require careful pinching, and disbudding throughout the growing season. This is exactly how they are displayed in Japanese exhibitions, in precise rows set under protective roofs. 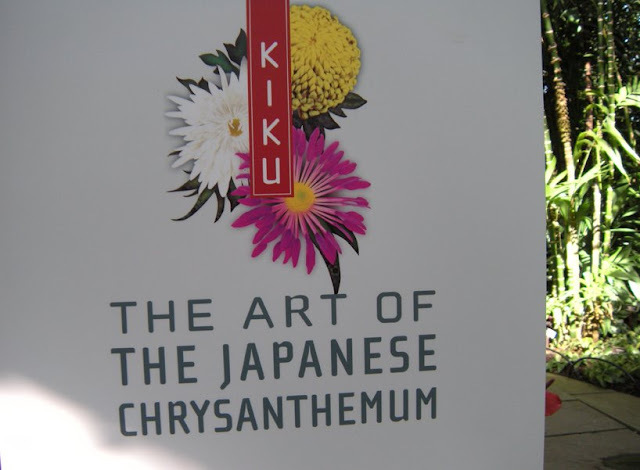 This glorious autumn weekend we had the luxury of attending the opening of Kiku -The Art of the Japanese Chrysanthemum held at the New York Botanical Gardens' Enid A Haupt Conservatory. As a solid Japanophile myself, having a local exhibition of such a collection is a rare and unique treat, since this is the second year that the NYBG has offered this exhibition. 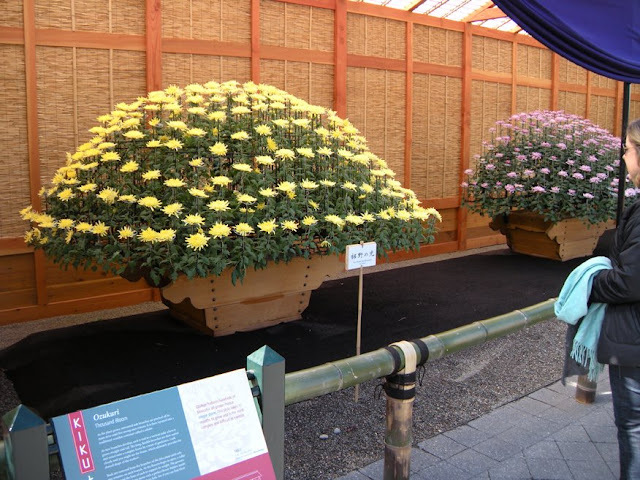 Most impressive is that this exhibit is the result of five years of a cultural exchange between the Shinjuku Gyoen in Tokyo, where for the past 100 years gardeners have perfected the art of growing and displaying exquisite chrysanthemums for the Emperor's garden. Under the training of Kiku master Yasuhira Iwashita, is is noted in the catalog of this years' exhibit that last year was the first time that the techniques and styles developed and displayed at the Shinjuku Gyoen were presented outside of Japan. This show runs from October 18 until November 16, 2008 at the New York Botanical Garden. Exhibitions of this quality and authenticity are rare outside of Japan. If you are in the New York or ti-state area, try not to miss this show - a show which takes an enormous amount of time and talent over a 18 month period. There are some very traditional patterns and forms which each takes years of apprenticeship to be able to achieve good results. 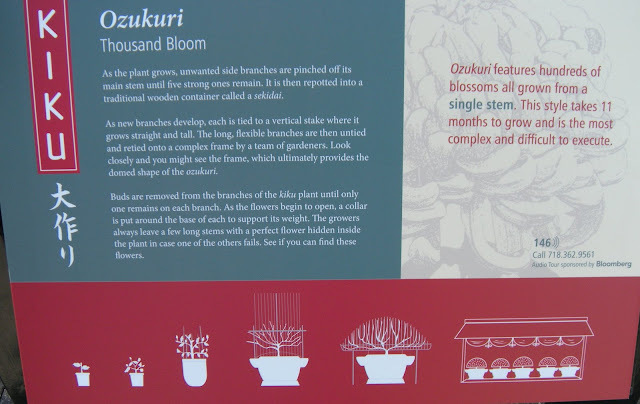 The New York Botanical Garden display demonstrates most every method of training (perhaps without the human-doll forms), which makes this show very tradional from a Japanese perspective. It seems no detail has been overlooked. 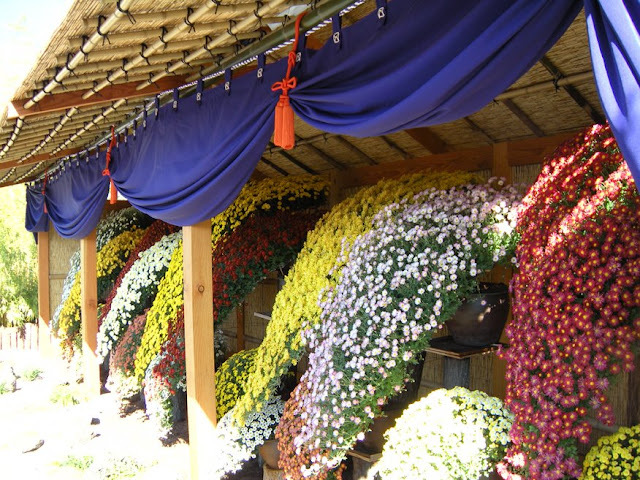 There was a time when chrysanthemum displays were more common in North American, which reached an apex of popularity around 1900, but given that displays were often limited to the wealthy, those with private estates and teams of gardeners or to horticultural societies (often those, which financial support from said supporters who saw value in supporting such displays) today, outside of Asia, chrysanthemum displays are virtually non-existent (except perhaps those which feature crotons, plastic orange pumpkins and hay bales from Home Depot. 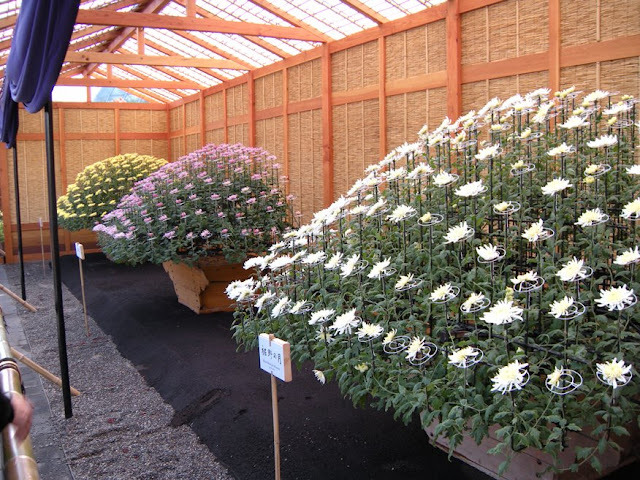 A formal conservatory chrysanthemum display itself may be a relic of the Victorian era, a traditional Kiku display featuring only the most traditional of Japanese forms, is something rarely seen anywhere at all outside of Japan. Thanks to the New York Botanical Gardens and it's dedication to horticultural talent and art, we al have been gifted this very generous treat - a portal to the Edo period, right here in the Bronx. 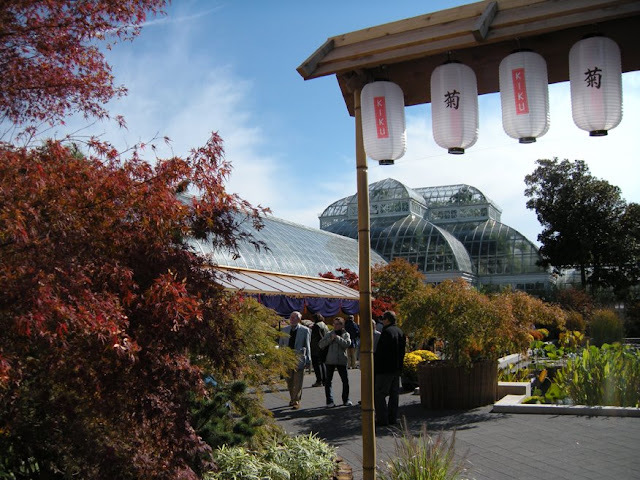 There are four Imperial styles of Kiku which are being displayed at the Enid Haupt Conservatory. These include the Ozukuri ("thousand bloom") amazing domes and ovals of giant, incurves and recurve (or what we might call 'football mums' trained to a frame and all grown from a single cutting - a study in geometry which has to be seen, to be appreciated, or shall I say,"to be believed'; the ogiku ("single stem"), kengai ("cascade'), and new this year, shino-tsukuri ("driving rain"). These plants are all housed and displayed in decorative Japanese garden pavilions known as uwaya. These intricate structures protect and frame the beauty of the kiku displays: they are constructed from bamboo and cedar and then edged with ceremonial drapery. Contemporary Japanese art from traditional materials adds to this years display. 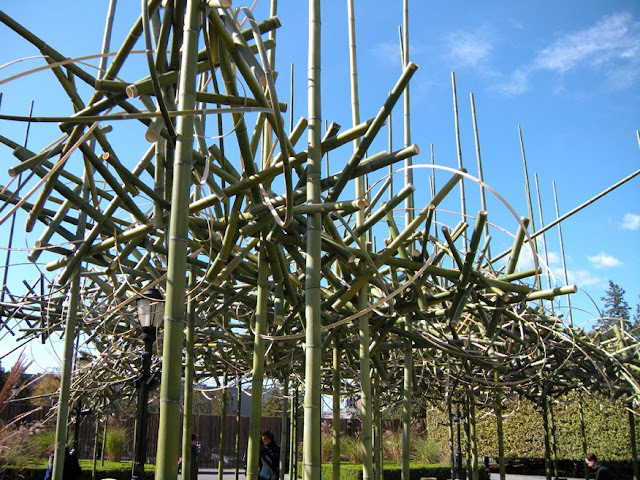 A magnificent outdoor installation of a massive bamboo sculpture by artist Tetsunori Kawana, a master teacher of the Sogetsu School of Ikebana,the traditional Japanese art of flower arranging. Kawana is known worldwide for his innovative installations using freshly split bamboo. The New York Botanical Gardens displays are attractive and immersive from every angle. I love the lanterns, music and the bonsai which all added to the effect. 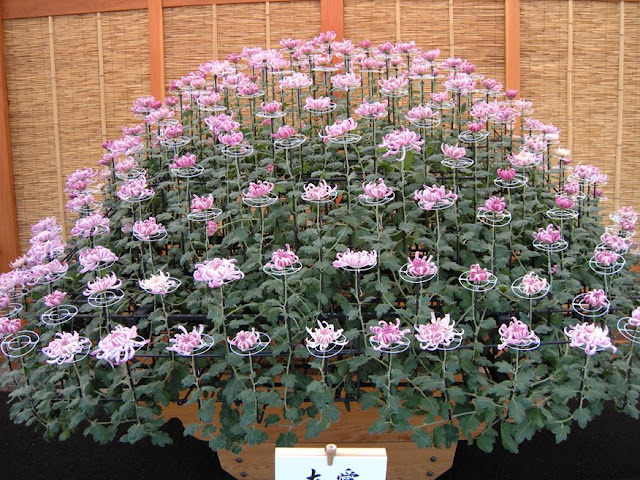 The amazing ozukuri style of training Chrysanthemums - perhaps the most difficult, this "thousand bloom" form takes 11 months of training from cutting, to this,. Yes...this is all from a single plant, and if you kneel down, you can see the single 1/4 inch thick stem of the entire plant! 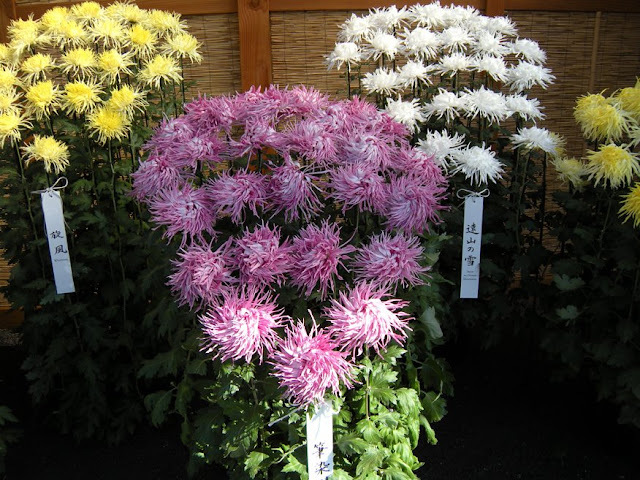 Cascade -trained chrysanthemums were most compelling and seemed like something that I could try at home. Finding books on the subject, however, has been difficult. But you know me! I will continue trying to find them before I give up! The cascade style might be more popular to some people in the States, if you visit a fine botanic garden, but this form is still rather unusual, the plants are trained like waterfalls. This cascade style was the first fancy exhibition style that I tryed. Yes, you can try growing these amazing Japanese forms at home ( by ordering cuttings from Kings Mums for delivery in June). 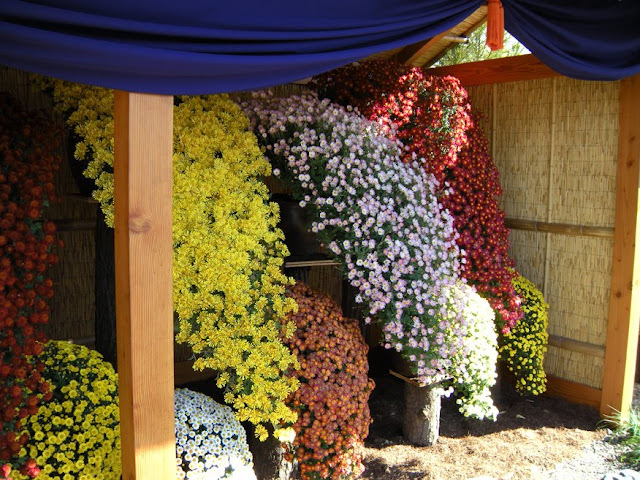 If I cannot find a book to show me how to train these mums, these images on the didactic panels at the Kiku display, are quite helpful.